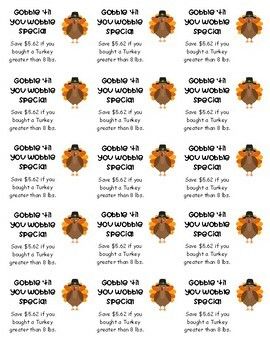 This is a fun and engaging activity that allows students to practice adding and subtracting decimals. 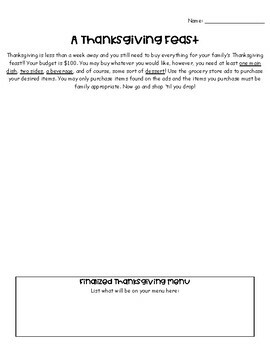 In this activity, students will plan a Thanksgiving Feast for their family or number of people that live at their house. They will plan their feast by "shopping" through local grocery store ads and adding their totals as they go. 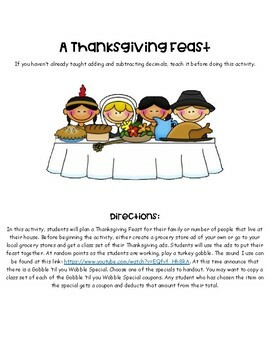 During the activity, there will also be times when there is a "Gobble 'til You Wobble Special" on certain foods. Students that receive the specials will subtract the amount of their coupon from their totals.